The weather was messy the last couple days, rain and wind. Days like these not only cause my sinuses to complain, but also make my decrepit old joints and muscles ache. I don’t know if you remember the old Three’s Company episode where the girls, for whatever reason, mistook the mother of the girl Jack was dating for the girl herself. (I know, its was unusual for Three’s Company to have an episode about a misunderstanding). In any event, Larry got in on the misunderstanding, and for some reason, ended up asking the mother about the fantastic scent she was wearing, only for her to say Bengay! I used to play (badly) a lot of ball back in my younger days as well, and I used to use the old Rub A535 for my aches and pains. 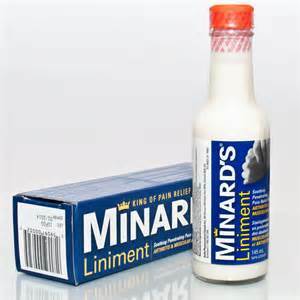 And I still use some heat cream from time to time, but when we were growing up, the product of the time was Mindard’s Liniment. I remember the older folks using it a lot, and mom would use it on us sometimes when we were achy or had a cold. She usually kept the bottle on the heater to keep it warm, but I remember it going on cold sometimes and feeling like ice. There was no hiding when you had it on either, you could smell it from across the house, perhaps across the community! Makes sense I guess when I learned that the main ingredients were camphor and medicinal turpentine. Just learned today when writing this that it was a product of Nova Scotia too. To me though it’ll always be linked with things like Nitre, and the old Chase’s Almanac. And that kinda reminds me of olive oil too, not the cooking variety, but the medicinal. Perhaps I’ll write about that soon.